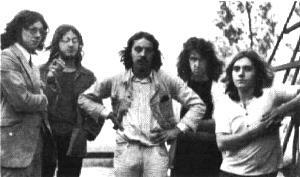 Five musicians formed a band in Dordrecht in1968, called The Floating Fudge Featuring The Cosmic Dealer. The members were: Angelo Santoro (bass guitar), Ad Vos (drums), Frans Poots (vocals, flute, sax), Bas van der Pol (vocals, guitar, ex-Hawks) and Jan Reynders (vocals, guitar, ex-Hawks). 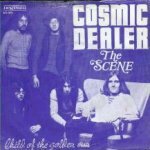 In 1970 they changed their name to Cosmic Dealer. In 1971 they released to singles, The scene/Child of the golden sun and Head in the clouds/Find your way on Negram. Both singles weren’t a big success. 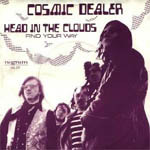 The two singles were followed by the release of Cosmic Dealer‘s debut album, Crystallization. The music is a mixture of psychedelic and progressive music, completed with some hardrock. The album was produced by Eddy Ouwens. The band toured regularly and did a performance in a TV show, but the album didn’t sell well. The same year Bas van der Pol left the band (who sadly passed away) and was replaced by Leen Leendertse, with him they recorded a few demo tracks. A little while later Angelo Santoro left the band. Cosmic Dealer struggles along, but a year later it is decided to stop.